​Reserve Champion first time out at WEF 1 in Pre- Green Hunters 3'3"
Winner of multiple equitation classes on the Vermont Summer Festival - ASPCA Maclay, USET Show Jumping Talent Search, USEF Medal, etc. Handsome, scopey, brave and honest. Ribbons at top East Coast horse shows, including Old Salem Farm, the Marshall & Sterling Finals, the Vermont Summer Festival, The Hampton Classic, Saratoga and Fieldstone. Third overall in the 2016 Junior Hunter Finals (3'3" Large Junior Hunter, 16-17). Reserve Championship in the 3'3" Performance Working Hunter division at WEF 3. Winner of Small Junior, 15 and under, Hunter stake and placed third in an over fences class at WEF. 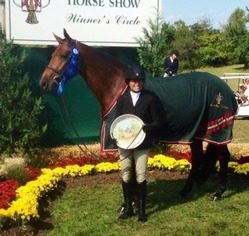 Champion in the First Year Greens at the Devon Horse Show with Amanda Steege. Champion at the Pennsylvania National Horse Show in the 3'3" Pre-Green hunters. Champion at the Lake Placid Horse Show. Champion on the Vermont Summer Festival in the 3'3" Pre-Green section, where he won all five classes. A very fancy Medium Pony hunter or Children's Pony hunter. 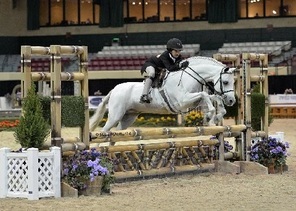 Click Here for Video of Watch Me Shine at the Capital Challenge Horse Show.